I was asked to comment on a newbie member's artwork in an art forum, and these are the graphics I prepared, based on the member's art. I drew the first one in my own way, but referenced the member's drawing for the pose. In the second one, I traced over the original in Photoshop, modifying form and shape as I went along (top-left). 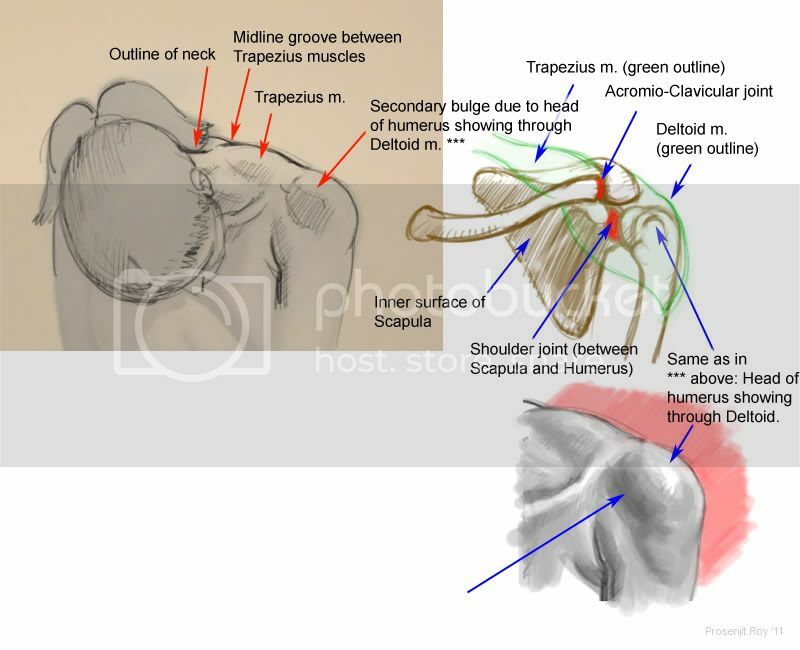 The shoulder anatomy, bone-joint lay out is something I drew to further elaborate on it. There were some issues with the shoulder and legs which I addressed. a drawing by katu06 in Wetcanvas. shadow of the sub(or supra)-bulge on the shoulder. Prosenjit, what a great blog!. I truly hope that many poeople can benefit from your wisdom and dedication and can also enjoy your drawings and paintings! !Asalways, I love your work. Thank you so much Lucrecia :) I don't have a definite plan for this blog, was just looking for a place to store my figure studies without objection from the 'moral' police. If I do more anatomy illustrations, I'll surely post here (as well).